While building a remote controlled led beacon for my lighthouse bookshelf, I learned that one single arduino can’t reliably receive commands from an IR module and control a demanding animation on an LED strand at the same time. The trouble is that both operations are highly time dependent. In simple terms, the IR module needs to be able to interrupt execution the moment it receives a command or the command will be lost or garbled. That is only a problem if the arduino is doing other things that can’t wait a few milliseconds. Unfortunately, updating LEDs is one of those things. The data transmission protocol for most of these LED strands is all based on timing, and you can’t stop in the middle of the stream. And of course, when I am trying to animate the LEDs, I want the arduino streaming updates out to them constantly, meaning there is never an acceptable time to wait around on the IR receiver. What we need is a buffer. We need something to be free to listen for commands from the IR receiver constantly, and that can store those commands until our LED streaming process has a break to check for new commands. For example, in between LED strand updates, and we want that break to be as short as possible so we can get back to updating LEDs. Fortunately for us, the serial communications system (called a UART) on the arduino has just such a buffer. When you send something through the serial communications system, it actually buffers what you send in the UART until the receiving end acknowledges that you have something to send and requests the transmission. So here is how it works: The arduino listening to the IR receiver gets a command, validates it, and then sends an appropriate command out to the LED arduino. That command actually gets buffered in the UART of the IR receiver arduino until the LED arduino requests it. On the LED arduino, each time we finish streaming a set of commands to the LEDs, we take a brief break and check to see if there are any commands waiting on the IR receiver arduino. If so, we grab them and deal with them appropriately, if not, we run the next LED update. 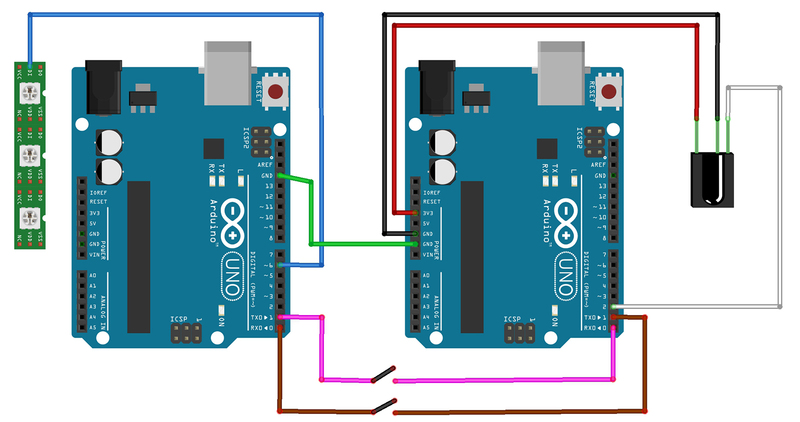 The wiring couldn’t be easier, the serial send pin on one arduino (pin 1) connects to the receive pin on the other (pin 0), and vice versa. The only hitch here is that the usb connection on the arduino actually uses those pins for sending programs, so as long as the two arduinos are connected this way and powered up, you wont be able to program them through the usb cable. To get around that, I just put a double pole single throw switch between those two connections so that I can disconnect the arduinos from each other for programming by flipping a switch. Drop by my lighthouse post for some code, and feel free to ask questions! 9 Responses to "Arduino – IR Remote Controled WS2811 Addressable LEDs"
Hi Mike, I too wanted to use an IR remote to control my LEDs but I don’t have a deep knowledge of electronics, so I tried following your project as an exercise but have stumbled into some problems. The one that erks me the most is that the IR communication works fine when the Arduinos are powered through my computer’s USB, but if instead it is powered by a DC adapter (12V 1mA) the IR communication doesn’t work anymore. If you can shed any insight as to why this has maybe happening, it’d be very helpful. Thank you in advance! Maybe to start with, do you know where the communication is breaking down? Between the arduinos, or between the Arduino with the IR sensor and the computer? If I understood things correctly, the arduinos would not be able to have their serial communications pins connected to each other and also talk through the USB port to the computer at the same time, since the usb serial connection uses the same bus as pins 0 and 1. Using pins 0 and 1 are basically the same as soldering wires to the USB connector, so when you connect the arduinos together with them you can’t use the USB port to connect to the computer. How far did you get? Are you able to plug your IR arduino in to the computer using USB and use the serial monitor to see that you are getting IR codes? Hi Mike, thanks for the reply, and at the same time, sorry for MY late reply! I understood that while uploading the code I cannot have the arduinos connected. The problem comes up when I run the code: It runs fine when I use the USB as the power source, however when I use the DC adapter instead, the IR receiver does not seem to respond! Hey Lincoln! Winter got crazy on me here. How is the project going, get anything figured out? I’ve got the exact same problem. I have everything connected up – when I am connected to the laptop I can see in the serial monitor window the remote codes are being sent – and the leds are changing sequences properly. When I disconnect from the laptop the serial port on the Arduino (that one the leds are connected too), the remote feature stops working – probably due to the serial port no longer being active. I’ve had to put a manual switch in – also a PIR to change sequences, as the remote only works when a laptop is plugged in (not great). Is there any workaround for this yet??? I was using one of those breadboard power connectors – but on checking the voltage was being dropped and so was the amperage – connecting the power to the Arduinos’s & led stip strip directly to the power supply, solved these issues. I did put a capacitor between the gnd and V+ on the led strip though – as recommended by the manufacturer. Thanks – now my WS2812B strip is working fine via remote – I used 1 micro Arduino to control the stip, the other I just used an atmega328 (plus crystal, caps, tsop4838) to send the remote signal via serial. I bought a pir as well – so the strip can change sequence if it’s pir activated, manually by push button switches or via remote. Fantastic! Glad you got it going, that sounds like a solid setup. Those LED strips are power hungry for sure. They’ll need a power bus if you string together more than a couple of meters, and they’ll overheat at full brightness white, but I love how bright they can get! What’s your final project? Feel free to link to a writeup or video or whatever, or if you’d like to write a guest post here I’d be happy to host it! I also have a Little one, six months old now! I have been fiddling around with WS2811 strips as well. I am planning on making a remote controlled star ceiling for her to grow up with, where one is able to flip through the constellations, Shooting stars etc with the remote. I bought 20 strips of WS2811´s. There are 30 LEDs in each Strip. I have noticed when using Demo Code that the LEDs work in 3( obviously chained in series) I was a bit dissapointed with this, as I thought I could individually Control each LED. Any thoughts on this Problem? Anyway, I plan on Building a Matrix with the LEDs and sticking them on a board, from this board I will stick Optic fibre strands to each LED, maybe about 5 Strands to Each LED… totalling 3000 stars. I will then have to work out how I will physically order the Strands in the ceiling. The hardest part though… is , as always the coding!!! I am very happy to have found your Lighthouse Project. I will be trying to follow your instructions. Hey Quint, that sounds amazing!! Sounds like you are taking on a pretty ambitious build! I can’t wait to see progress, please do come back and post links or pictures! Maybe you could write up a guest post or something too! You can’t really properly dim LEDs, they are either on or off. The way we make them look dim is to blink them absurdly rapidly. The longer the on time, and the shorter the off times, the brighter the LED seems. They call it Pulse Width Modulation, or PWM. So the WS2811 is a little microchip that can be addressed (called on specifically among a set), and has three channels of pulse width modulators built in. There is probably a little black chip every three LEDs on your strip, thats what that is. The little white square LED thing on the tape with the circular front window is actually a package of three LEDs in one package (red, green, blue), its called an SMD 5050. In the case of the strip you have, you can send a color command to the WS2811, and controls the nearest 3 SMD 5050 LED packages as a unit. It handles all the PWM stuff for those LEDs to get the color you asked for out of them. There are also strips that have one WS2811 for each SMD 5050, so you can control each LED package individually. To go a step further, some clever person decided to pack a WS2811 right down inside the SMD 5050 package, so that you have a little white square with a controller chip and 3 LEDs all packed up in a tidy little unit. That thing is called the WS2812 or WS2812b. Some strips use these, which means each LED is addressable individually, and there are no little black chips on the strip, since they are built in to the LEDs. Ok, so thats a little primer on these LED strips. Unfortunately, that means you are stuck controlling them in packs of three, unless you want to grab new strips. WS2812 or WS2812b are what you’ll want, and you still use the WS2811 controller libraries for them, since that is what they are, just packed in to the LED case. You could probably unload the ones you have on ebay at not much of a loss. Or, it sounds like you might be able to just spread your fibers out over all three of the LEDs in each ‘pixel’ and maybe get some more light per star? This thing sounds fantastic! If you need any help adapting the code, please don’t hesitate to ask, that would be the easy part for me compared to the fiber management and stuff!